- Add a convenient button (optional) under the Transform inspector to let you quickly move the pivot of your GameObjects. - Edit pivot visually using Gizmo handlers directly inside the scene view or by typing exact values in edit boxes. 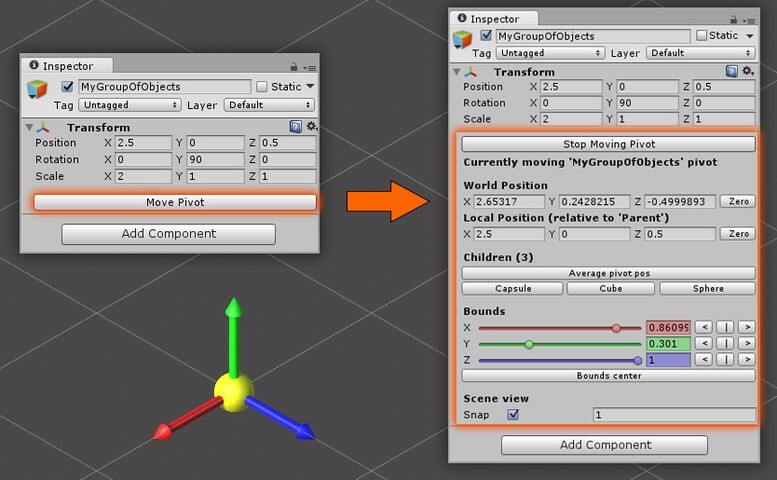 - [PRO only] Precisely adjust the pivot according to the (displayed) bounding box using convenient sliders per axis. - [PRO only] Handy buttons to instantly adjust the pivot according to the child of your choice, or to the average position. - Dynamically edit pivot at runtime from script using our easy-to-use public API (check our sample 'ChangeAtRuntime'). - [PRO only]Get notifications from the editor API to implement your custom code (check our sample 'EditorCallbackListener.cs'). - Handles Unity's Undo/Redo shortcuts. 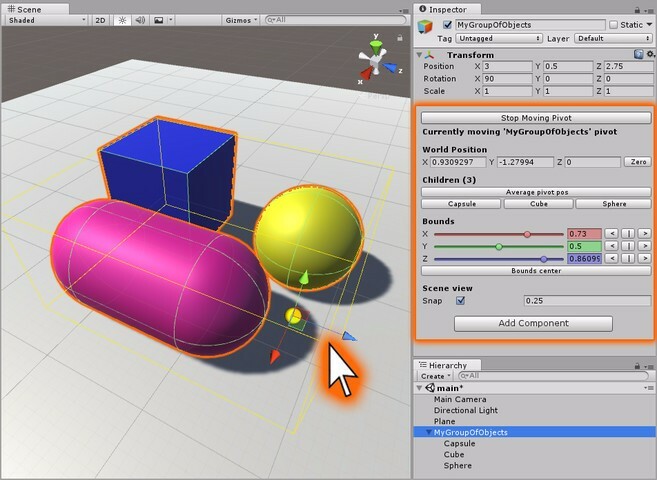 - [PRO only] Supports multi-object selection and editing: change the pivot of multiple objects at once! - Supports rotations and scales. - Grid snapping feature for more precise work. - Full source code available / no DLL. - Supports from Unity 5.2 to latest 2017 versions. - Super Pivot doesn't let you modify the pivot point of a Mesh (because it would modify the Mesh data). Super Pivot's main usage is to move pivots of empty GameObjects used as "folder".